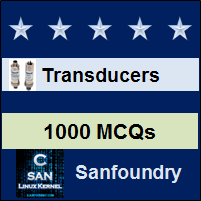 This set of Instrumentation Transducers Multiple Choice Questions & Answers (MCQs) focuses on “Microprocessors”. 1. Which of the following is correct for microprocessor Intel 8085? Explanation: Microprocessor Intel 8085 is a 8 bit microprocessor. Explanation: MOS or Metal Oxide Semiconductor is an IC technology. 3. Microprocessor contains large on-chip memory. Explanation: Microprocessor is a small version of processor which lack on-chip memory. 4. Which of the following part of microprocessor is close related to register? Explanation: Registers are basically memory segments used for storing address of locations. 5. Which of the following is not a special function register? Explanation: Accumulator is a general function register, which can be used for multiple functions. Explanation: SP is the short form of stack pointer which store address of stack top. 7. Which of the following is not a valid instruction type? Explanation: Instructions are divided into different types according to number of operands. 8. How many flags does 8085 have? Explanation: 8085 contains 5 flags such as sign flag, zero flag, parity flag, auxiliary carry flag, and carry flag. 9. Which of the following is used for storing flag registers? Explanation: Status registers are used for storing flag registers. 10. Which of the following function relate to stack? Explanation: Push function is used for inserting value to stack and pop is used for retrieving data from stack.